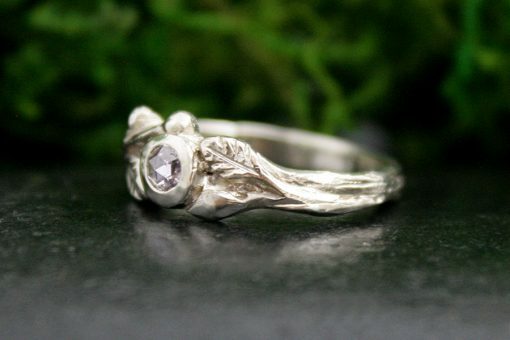 The Sitka Ring in 14k white gold with a pink rose cut diamond joins forces with the rustic Men’s Leafy Band in 14k white gold. 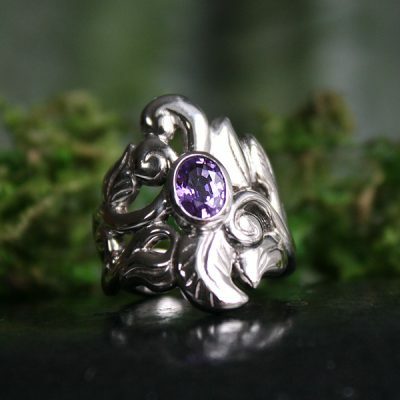 They make a dazzling set, carrying the magic of the forest, inspired by Mt. Maxwell on Saltspring Island. 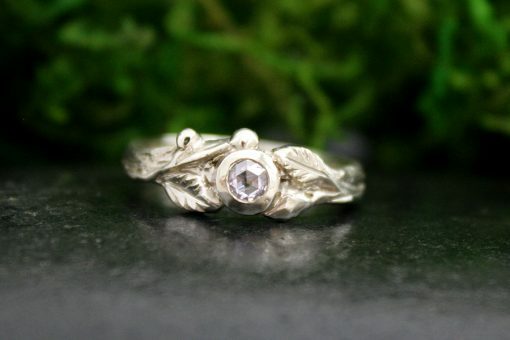 Each ring could be customized in either white, yellow or rose gold, and each are sold separately as well. 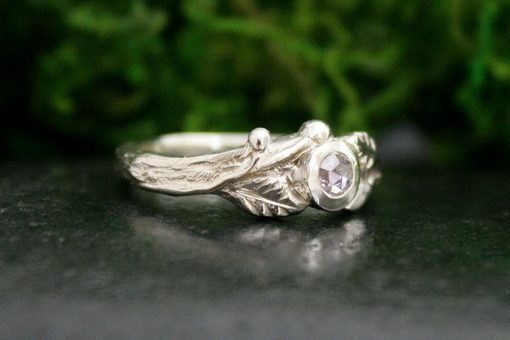 The Sitka Ring is part of my Forest Nymph ring series, a body of designs born of bedrock, rich moist soil and downy moss, tree roots reaching, knotting around it’s community forest, arms far reaching down into the earth, crawling over rocks, holding tightly to it’s family of trees, right up to the rooftop canopy, arms spread to the heavens above. The chanting of the birds weave their song between the rich velvety silence, all echoing in one knowing sound. 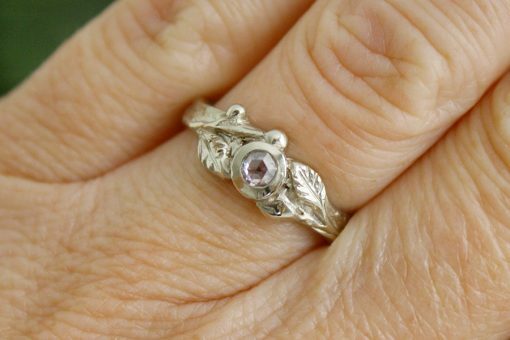 Hand carved leaves and sprigs frame this extraordinary pink rose cut diamond. 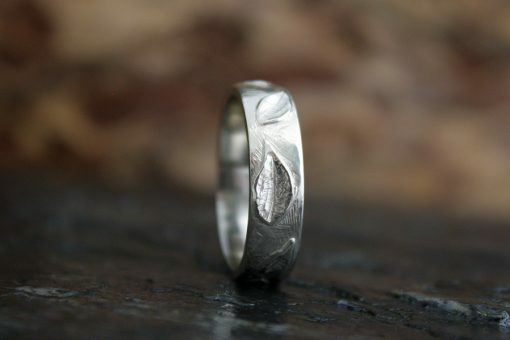 Hand carved with a rustic wood grain texture with a top design of wind swept leaves cascading across the ring. 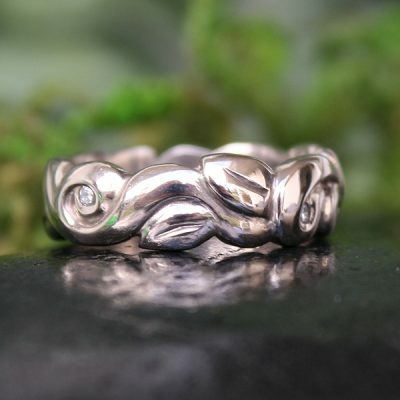 Carved to a 6.5mm width and a 1.5 mm thickness for ultimate comfort….including a comfort fit on the inside of the ring. 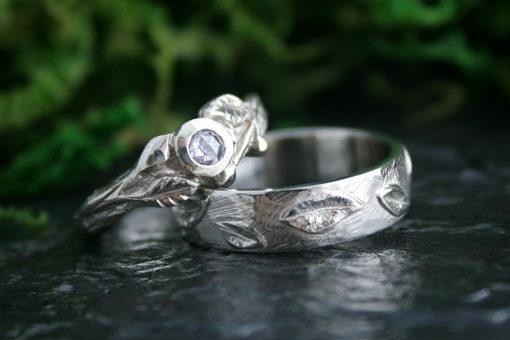 This ring could be customised to a broader width. Hand polished with a matte and wire brush finish.